We have released Auto PeakTrace RP 6.60 for Windows (XP to Win 10) and MacOS X (10.6+). This major upgrade improves trace processing, appearance and basecalling quality. This release is an essential upgrade for all uses of Auto PeakTrace RP as it introduces a breaking change for the set abi limits option. Users that don’t upgrade will no longer to be able to hard trim traces. In addition to changing the default value for the set abi limits option, PeakTrace 6.60 introduces a new basecaller setting – reltrace. The reltrace option outputs the raw data baseline, slightly smooth and mobility shifted with either the original KB basecall or the PeakTrace basecalled trace. The setting is useful if you wish to obtain data as close to the raw data as possible avoiding all the data manipulation that both KB and PeakTrace normally perform. This setting is useful if you wish to use the peak height data to perform downstream data analysis since the relatively peak heights in the output will match those observed in the raw data. The full list of changes include. New Feature. RelTrace. This outputs a usable raw data chromatogram that can be used with downstream applications to detect polymorphisms. New Feature. Use of set abi limit without trimming outputs trace file without removing non-basecalled region. New Feature. .seq files are output with trace trimming when set abi limits on. New Error Code: 23. KB fallback failed. 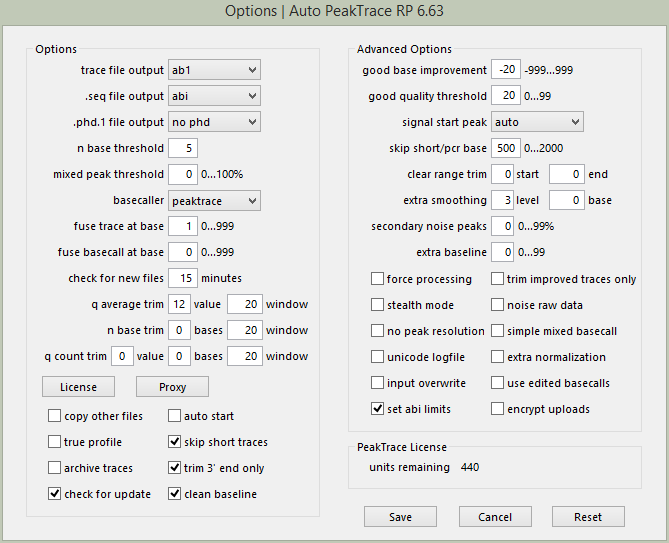 Auto PeakTrace RP 6.60 for Windows and MacOS X can be downloaded from the PeakTrace RP downloads page. This release will soon be available via automatic update and is a CRITICAL upgrade for all users of Auto PeakTrace RP. 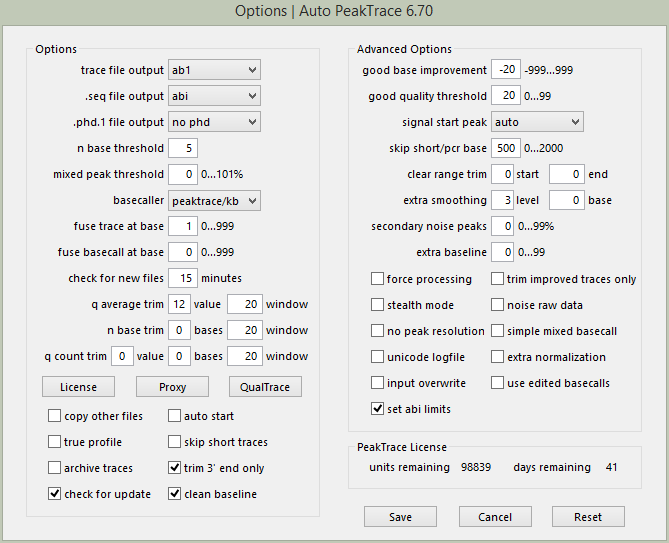 We have released an update for Auto PeakTrace (6.53). The release improves peak and trace normalization. Improved peak normalization of traces especially those derived from PCR products and/or traces where set abi limits has been used. Improved extra normalization of traces derived from PCR products to avoid normalization of the noise regions after the trace signal ends. It is possible that the PeakTrace Serial Number will need to be entered again after installation. If so, just press the back button on the registration window and enter your existing serial number. We have released a small update for Auto PeakTrace (6.52) to fix a bug in the copy other files option introduced in Auto PeakTrace 6.47 that prevented the non .ab1 files from being copied to the output folder when located in sub-folders. This bug only affects Auto PeakTrace on Windows and is optional if you are not using the copy other files setting. This release also updates the required CodeMeter Runtime to 6.40b. This release from Wibu fixes a bug specific for Windows XP users that may cause the license to no longer work. It is possible that the PeakTrace Serial Number will need to be entered again after installation. If so, just press the back button on the registration window and enter your existing license serial number.